The Israeli government continues with actions to impose a defacto position, in the occupied West Bank, as part of its annexation policy, and attempts to apply Israeli law on the settlements. The so-called Central Command has recently ratified the enactment of two agricultural laws on settlements that were illegally built since 1967. Thus, Deputy Minister of Security, Eli Dahan said that the two laws deal with matters related to agriculture in the settlements. The first is the Organic Production Regulation Law, which was first enacted in 2005, and regulates control over organic agriculture in Israel. The second was enacted in the Knesset, a few months ago, in order to enable poultry farmers to transfer the shares of eggs produced in settlements to the Israel. These laws were approved by the Knesset and applied on the Green Line in addition to others, such as the Israeli Higher Education Council Law on Higher Education Institutions in the Occupied Territories, which led to the establishment of the Faculty of Medicine at the Ariel University. According to the PNN, the head of the Jewish Community, Naftali, also confirmed his party’s commitment to the implementation of Israeli law in the settlements, while Minister of Agriculture Uri Ariel said that they are working all the time in order to apply the regulations on agriculture in Israel. In turn, Ben Dahan said that he will continue to work to sign orders that benefit Israeli citizens in the Judea and Samaria. At the same time, Israeli Justice Minister, Ayelet Shaked stressed the political plan adopted by her party, “the Jewish Home,” to annex Area C, which is 60% of the West Bank, and finishes the two-state solution, adding that Israel can absorb some 100,000 Palestinians living in area C. Israeli economy and industry chief Eli Cohen said that settlement in the West Bank will not stop, and the current government is continuing to build more housing units in the West Bank. His words came during the inauguration of an industrial zone at the Qiryat Arba settlement, in Hebron. Gamliel claimed that the funding of the project is part of a broader project to document the relationship of different Jewish communities in Judea and Samaria, including immigrants from Arab countries, Iran, Ethiopia and India, and to honor the great contribution of the founders of Jewish settlement in Israel. Also, settlement projects continue under Israeli Defense Minister Avigdor Lieberman, who said he would submit a plan to the cabinet for building 31 new settlement units in Hebron. He said, on Twitter, that the plan includes what was recently approved by the planning institutions, including the construction of new homes, kindergartens and public places. 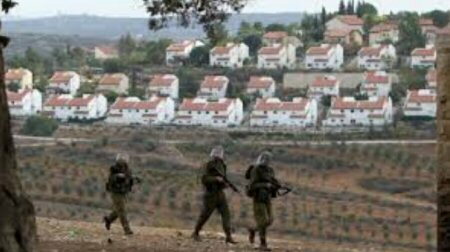 Israeli occupation authorities also approved the addition of 8 new units in the settlement of Majdal Oz, near Beit Fajar, south of Bethlehem. In the Salfit Governorate, Israeli occupation authorities served Al-Zawia Municipality, west of Salfit, with a military decision to seize more than 8 dunams of the village’s land in the area called “Sarsia-Majin Dan”, for military purposes. It is noteworthy that, about two months ago, occupation authorities also announced the seizure of lands of the Al-Zawia, in basin number 4, in the Wad Najafat, Khayal-Kisabra and Khallet Hamad areas, amounting to somewhere between 140 and 177 dunams, for the establishment of a new cemetery for settlers. In Jerusalem, the Israeli occupation municipality plans to build 10 parking towers near the Old City, as building permits were issued last week for the Aden Company. It allows the construction of 6 towers near Damascus Gate and 4 near Al-Aqsa Mosque, 15 to 17 meters high, and accommodating 12 cars each. Just recently, Palestinian citizen Aisha Moh’d Radhi, aged 45, from the Bidya town, west of Salfit, was killed by Israeli settlers acting under the protection of the occupying forces, near the Za’tara checkpoint, south of Nablus, and her husband was seriously injured in the head after settlers threw stones at their vehicle. The Israeli government also has a plan, known as “2050”, to connect occupied East Jerusalem and the settlements of the Ghor, in Tel Aviv, by a rail network and wide roads, with an airport that occupation authorities intend to build in Al-Buqai’a and the Dead Sea area. The plan is one of the largest in Israel, with 12 million tourists and 35 million passengers expected to participate. The central objective of the plan is to expand the settlements established in this area, and to swallow the Ghor area, as a barrier to any normal Palestinian expansion.